If you’re a UK resident, you need to pay UK income tax on your dividends from foreign shares and UK capital gains tax on any sale proceeds. There’s no getting away from being taxed just because you’ve bought foreign assets. You will generally escape being stung with UK transaction taxes such as stamp duty, although some markets will also charge their own local levies. But that’s the only break. You usually need to declare your savings and investment income from abroad. These principles are very simple. Where it gets complicated is that many countries will levy their own taxes on this foreign income. So when you receive a foreign dividend it will often have had some tax deducted at source. You are then due to pay a further round of tax on the same income to the UK tax authorities. So if you’re unlucky, you could end up being taxed twice on the same income. You can stop this happening. But you need to be alert and know how the system works. In theory, this double taxation shouldn’t happen. In most cases, there will be a limit to how much the foreign tax authorities deduct from dividends being paid to a UK resident. And any foreign tax paid can usually be offset against any UK tax (under a system called Foreign Tax Credit Relief) that would be due on that income. The UK’s double taxation agreements usually set out the maximum rate of tax that a country can charge a UK resident receiving dividend or interest income from that country. This is known as withholding tax, because it’s withheld when the payment is made. The typical rate under most of the UK’s treaties is 15% – a detailed list is here on the HMRC website [PDF]. So in theory, a UK investor will generally receive his dividend net of 15% tax. He then declares his dividend and calculates his tax. The actual way in which this is done is typically complex, but the outcome is relatively simple. UK dividends come with a notional dividend tax credit of 10%, for reasons that are rather complicated. A basic rate taxpayer has UK dividends taxed at 10% and so has no further liability, because this is offset by the tax credit. Following a change in the rules in 2008 – a change that for once worked in the taxpayer’s favour – foreign dividends are now granted a theoretical credit of the same amount for UK tax purposes. So if you receive a dividend equal to £900 from a foreign source (inclusive of £135 foreign withholding tax that’s already been deducted), this is then grossed up to £1000 [=900+(900*1/9)] for tax purposes. You then calculate the theoretical tax due at your highest dividend tax rate. For basic rate taxpayers, that’s 10%. For the next two tiers, the tax due is £325 [=1000*32.5%] and £425 [=1000*42.5%] respectively. From that, you deduct away the withholding tax already paid and the amount of the theoretical tax credit. What remains is your net UK tax liability. Note that you can only deduct the foreign withholding tax paid up to the maximum UK tax liability on that particular dividend. You cannot roll over any unused tax credits to your wider tax bill. So in the above case, our basic rate taxpayer has no further liability in the UK, because the 10% tax rate and the 10% credit completely offset each other. But he can’t reclaim the 15% withholding tax already removed by the country of origin. The other two tax bands can offset it against the tax they still owe. This example is slightly expanded from one in the HMRC guidelines on dividends from foreign companies (2011 version), available here [PDF]. So far, so good. The complication is that many countries withhold more than the specified amount in the double taxation agreement anyway. These are drawn from tables at Dow Jones [PDF] and Deloitte, among others. There are a couple of inconsistencies in the figures – I’ve gone with what seems to be most common in other sources. If you’re looking for other countries, most major ones are listed in those tables and HMRC list of agreements [PDF]. 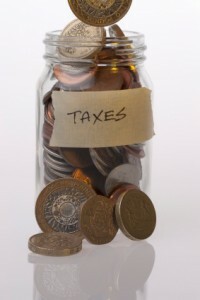 Unfortunately, the amount above the withholding tax rate cannot be off set against UK tax. If the double taxation treaty specifies a withholding rate of 15% for UK residents, but the country routinely withholds 25%, you can only offset the 15% against UK tax. To get back the excess, you need to reclaim it from the tax authorities in the relevant country. If you don’t, you end up paying more tax than you need to. For a small number of countries, you can simplify things by notifying the tax authorities that you are resident in a country where you are entitled to a lower rate of withholding tax. This will ensure that your dividends are taxed at source in line with the withholding tax approved in the UK double taxation treaty. The most important example is the US, where the default tax is 30%, but the rate for UK residents is 15%. The withholding tax on your dividends will be reduced to 15% if you complete form W-8BEN [PDF]. Most brokers will automatically get you to do this on opening an account that allows you to trade US stocks. Most other countries are not so easy to deal with. In many cases, you will have to reclaim the overpaid tax retrospectively. This can be a major headache. In theory, your stock broker should deal with much of this for you. In practice, they may not, or may only do it for certain countries. And if you open a brokerage account in a foreign country, they may be even less likely to do so – understandably given all the cross-jurisdictional complications involved. If your broker doesn’t handle it, it may be worth trying the custodian who holds your shares or the depositary bank responsible for issuing ADRs and GDRs, if you hold the shares through that route. These companies are sometimes helpful and sometimes not. There are also specialised companies that will do the work for you, at least where the dividends are being paid from companies in major countries such as the US, France or Germany. They will charge a fee, but it may still be worth your while. However, the feedback on many of these agencies seems to be quite negative, so investigate thoroughly before signing up to one. Otherwise, you can try to handle the paperwork on your own. See here for forms to reclaim withholding tax for certain major countries. Or you may find it easier to hire a decent accountant or tax adviser and get them to do the work for you. Of course, the simplest answer is to try to minimise the tax take in the first place. For dividends, focus on countries with low or no withholding tax, or those with the most straightforward reclaim procedures. And consider which foreign stocks you should hold in an ISA or SIPP to get the most tax relief. These vehicles won’t give you additional relief on foreign withholding tax (except in a few cases where a SIPP is entitled to extra WHT reductions and the administrator implements this), but will let you shelter foreign income and capital gains from further UK tax. Exactly how best to do this depends on your personal tax circumstances. Again, a good accountant or tax adviser may be able to help you make your portfolio more tax efficient, if you’re not keen on crunching all the numbers yourself. It’s worth mentioning that there are a few countries that have double taxation treaties with the UK, but where dividend income can’t be offset against UK tax using Foreign Tax Credit Relief as described above. They are shown in the table below (the source is the HMRC guidelines linked above). For dividends from these countries, you have to use a less favourable system, which HMRC calls deduction. This reduces the taxable amount of the dividend by the amount of tax already paid. You then calculate UK tax on the remaining net dividend. For basic rate taxpayers, this does not by lead to any further liability, but it can increase tax for a higher rate or top rate taxpayer. That’s easy to see with an example. Assume you receive £900 from a foreign stock, on which you’ve paid £135 withholding tax. You’re a higher rate taxpayer. Using the Foreign Tax Credit Relief, you are due £325 in tax on the grossed-up dividend, from which you can subtract the withholding tax paid and the UK tax credit for a net UK liability of £90 (as shown in the example above). Using the deduction method, you can only subtract the £135 tax from the dividend before you calculate the UK tax due on it. The net dividend is £765 [=900-135], which grosses up to £850 [=765*10/9] (note you still use the 10% UK dividend tax credit in the calculation). Tax on this comes to £276 [=850*32.5%], while your notional UK tax credit is £85 [=850*10%]. Deduct this away to get a net UK liability of £191 – significantly more than in the previous calculation. The one mitigating point here is that jurisdictions for which only the deduction method can be used tend to have very low or no dividend withholding tax and/or corporation tax. So the amount of tax that your dividend has already suffered before it gets to you is reduced. The deduction method is available for other countries as well. But as the example above shows, you will almost always want to use the credit method instead, because it lowers your taxes. There are also certain circumstances in which the notional 10% UK dividend tax credit does not apply, notably countries where there the double taxation agreement does not include a non-discrimination article. These are listed in the table below (again the source is the HMRC guidance notes for 2011). Some of these overlap with the countries that do not get Foreign Tax Credit Relief, in which case presumably you must apply the deduction method and do not get a notional 10% tax credit, which would create liabilities even for basic rate taxpayers (the HRMC guidance is not explicit on this point). However, looking at the list of countries where both restrictions apply, I can’t see that problem coming up often for most retail investors. In contrast to dividend income, you will usually not find capital gains tax imposed on sales of foreign stocks. You will simply need to pay your UK capital gains tax at the usual rate. If tax is deducted from your proceeds, you should be able to obtain Foreign Tax Credit Relief against any UK liability. Some details are available from HMRC [PDF]. If the foreign tax paid is less than the UK capital gains tax bill, the UK bill will be reduced by that amount. If the tax paid in the foreign country is greater than the potential UK tax, the excess cannot be offset against other UK tax or capital gains. If excess capital gains tax is deducted at source, it’s possible you may be reclaim this from the relevant country. However, this typically happens in countries that don’t have particularly streamlined and efficient tax systems – so be prepared for a fair amount of research and letter-writing. Finally, remember that tax is an extremely complicated subject. How much tax you have to pay depends greatly on your personal circumstances. This article is provided for general information and research purposes only. I am not a tax expert and my current understanding of all points covered in this article is not certain to be correct. You should seek professional advice to clear up any awkward issue. If your tax affairs are at all complicated or you’re dealing with a significant amount of foreign assets, I strongly recommend you consult a specialist, since they may be able to save you a substantial amount of money over the long run.